The Opinionated About Dining Survey is featured in article on restaurant dining guides on page 9D of the November 30th edition of USA Today. Despite the fact that we have to share the article with those other two guides, this is a step in the right direction for the survey and just the beginning of our quest to create the best restaurant dining guide on the market. Now that I have launched a publicity campaign which is intended to promote the Opinionated About Dining Survey, I have run into the inevitable Catch-22 one finds in the world of media. It goes like this. In order to get publicity you already need to be well known or even famous for doing the thing you are trying to publicize. But that begs the question, how can you be well known or famous without having already gotten publicity in the media? Well obviously you can't. So what happens is a slow and tedious process whereby you go about trying to convince the press that your idea is newsworthy. The thing is, one editor's newsworthy is another's ordinary, and invariably, you end up plugging away until you find someone who puts the pieces of the puzzle together and anoints you (or your idea,) as something that is fit to print. A key aspect in this process is establishing your credentials. In this particular instance, the media wants to know, "why this guy?" What is it that sets this Plotnicki guy apart from the rest of the pack of self-appointed food critics who think they have something valuable to say? If I had a dollar for every time our publicist, Melanie Young, or I, was asked that question, I could probably take you to lunch at Katz's Deli. The importance of this issue hit home for me earlier this week, when during an interview with a major daily paper, the writer asked me for my dining credentials. I have to admit the question caught me a bit off guard. Not because I don't believe in the concept - you often hear me complain that there are restaurant reviewers for major daily papers who haven't visited the important restaurants - but I wasn't fully prepared to answer the question either. I hung up the phone and thought about it for a bit and I had the bright idea of creating a dining resume. A Curriculum Vitae. Only this would be about food. Hence, the creation of the Culinarium Vitae. 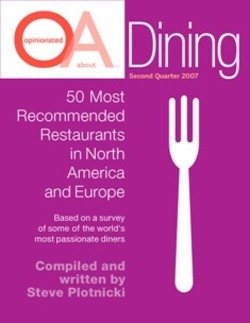 If you are tired of seeing restaurants in cities like Cleveland getting higher ratings than restaurants in New York & Paris, request a free, downloadable copy of the Opinionated About Dining, "50 Most Recommended Restaurants in North America and Europe." By using a global panel of reviewers, and by weighing the opinions of the people on the panel based on their level of experience, OA has put restaurants in cities like Cleveland into their proper place. And all you have to do to get a copy is to click on the link below and leave us your name (full names only please) and email address and we will send you a FREE DOWNLOAD of the 50 Most Recommended Restaurants in North America and Europe. And for those of you who are opinionated on the topic of fine dining, there is a space on the download request page where you can notify us that you would like to particicpate in our next survey.. Thanks for supporting Opinionated About Dining and I hope you enjoy reading the "50 Most Recommended." Ever since I was old enough to take the subway into Manhattan from my parents’ home in Queens, N.Y., and I began to discover the culinary wonders the world has to offer, I’ve been passionate about dining. What started out as a search for, say, the best hamburger or the most succulent Chinese dumplings evolved over time into a full-blown love affair that now takes me all over the United States and Europe to eat at some of the world’s greatest restaurants. In the course of my culinary odyssey, I’ve developed many friendships with people who share my passion. Invariably, our discussions would turn to the subject of dining guides—the qualities that make them useful and the flaws that render them less so. The Opinionated About Surveys are the result of those discussions, and an attempt to correct the flaws we identified. One of the targets of our criticisms was the failure of many guides to calibrate ratings between different geographic locations, with the result that restaurants in cities not known for fine dining often receive higher ratings than important restaurants in New York or Paris. Another is a reluctance to demote once great restaurants even after years of poor performance. But what we objected to the most was the general lack of transparency regarding the identity and qualifications of reviewers. It seemed clear to us that in many cases reviewers in one location were less qualified than reviewers elsewhere. I made it my goal to create a guide that would avoid these pitfalls and that my fellow passionate diners would find more useful than anything available in bookstores today. The key to producing this new, improved dining guide lay in my ability to gather information from those whom my friends and I affectionately describe as “Destination Diners.” These are people who, like us, travel for the purpose of eating in the world’s best restaurants. I began working on a methodology that would allow me to capture and compile this information, while giving more or less weight to the opinions of diners based on the number and geographical diversity of the restaurants they had visited. This past January, I started collecting data from these diners in an online survey. The "Top 50 Most Recommended Restaurants" is the result of those efforts. Please click on the link to get your free downloadable copy of the survey. While participation in this version of the survey was limited to friends of the Opinionated About Dining blog and discussion forums, those who are interested in participating in the next version of the survey, which will be launched around August 1 with the results intended for publication this fall, can inform us of their interest when requesting their copy of the download by checking the box about future surveys. And coming this fall, OA will launch surveys featuring moderate and inexpensive dining destinations in both North America and Europe. To get your copy of the survey, please click on the link at the top or bottom of the page and fill out the short information form. I hope you enjoy the Opinionated About Dining Top 50 Most Recommended and good eating!